The Pitch | News and Features | Style Weekly - Richmond, VA local news, arts, and events. Mayor Dwight Jones’ vision for Shockoe Bottom calls for a new neighborhood anchored by a sunken baseball stadium, with a $30 million fundraising campaign for a slave heritage museum and campus. 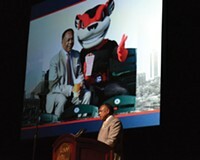 Richmond Mayor Dwight Jones drew applause and heckles when he announced his plans for a baseball stadium designed to anchor a new neighborhood of housing, a grocery store and a hotel in Shockoe Bottom. He spoke Monday from a podium in a gravel parking lot at East Grace and 18th streets. That spot would become home base in the new stadium, he said. The plan calls for 750 new apartments in the Bottom, 200 of which would flank the stadium, along with a full-size Kroger grocery store, a 200-room Hyatt hotel and a slave heritage site two blocks away behind Main Street Station. The stadium would be in what Jones described as a "sunken bowl" holding 7,200 seats with a retractable roof. It would replace The Diamond on the Boulevard. 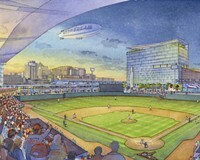 "This will be the best ballpark in minor league baseball, with every possible amenity," he said. "That's a dramatic improvement over these crumbling parking lots, where the flood plain has kept this area untouched for decades." The statement drew cheers from several hundred supporters encouraged to attend by the downtown booster organization Venture Richmond. They ate free hot dogs, and many of them wore T-shirts the group handed out that said "Loving RVA," part of a marketing campaign launched to support the mayor's plan. 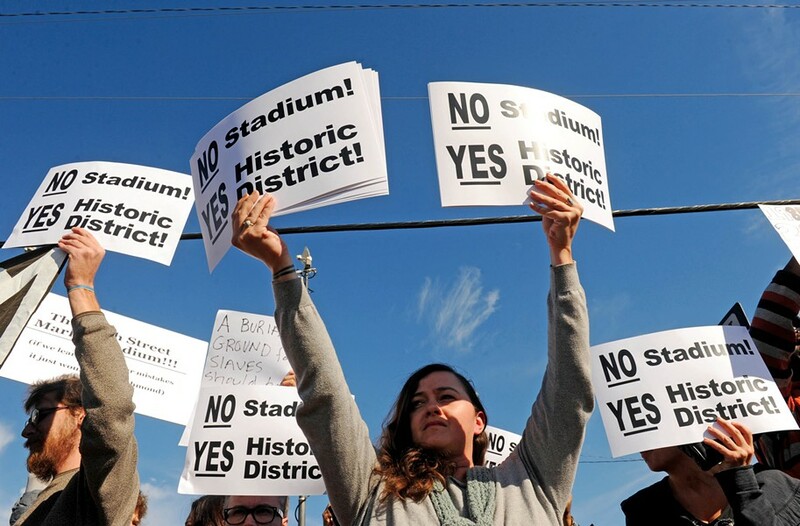 About 75 protesters stood behind them, holding signs and banners opposing placement of a stadium in a district once the second-largest slave market in the country. Many protesters shouted their disapproval throughout the 30-minute presentation. Protesters interrupt the mayor during a news conference Monday, while he announces a plan to move the Richmond Flying Squirrels to Shockoe Bottom. Critics say the ballpark will desecrate ground where hundreds of thousands of slave were once sold and imprisoned. As expected, Jones announced the simultaneous development of the slave heritage site, which would be located in the strip of land between the railroad tracks and Interstate 95. Jones said Stephen Gannon, deputy general counsel for Capital One, will lead an effort to raise $30 million for the slave history development. A steering committee will be appointed to oversee the plans. 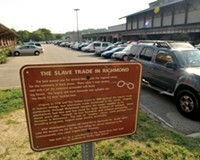 Jones was joined by state Delegate Delores McQuinn of Richmond, the chairwoman of the city's Slave Trail Commission, who opposed previous plans for a ballpark in the Bottom. "I believe this is the one chance we have to honor our history in a big way and I'm excited about it," McQuinn said. "This is a moment to transform Richmond. I must be honest that I'm not that excited about baseball — don't throw eggs at me. But if a new baseball stadium can help make it possible to invest in commemorating Richmond's history, then we should certainly explore it." Protesters were unmoved. Other people expressed concerns about financing. Jones said the projects would generate net tax revenue of $200 million during the next 20 years. The total cost is projected at $200 million — $79.6 million of which will come from the city. Specifics are forthcoming, said the mayor's press secretary, Tammy Hawley. 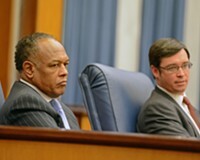 Jones said the plan won't affect the city's debt limit. The mayor still must win support from City Council, many members of which have expressed skepticism. City Council President Charles Samuels said that while there was support from the corporate community, the public needs to weigh in on the stadium. "This is a great start to a discussion," he said. "But it's just a beginning so we can get finally down to brass tacks and figure out if it's better in the Bottom or better on the Boulevard." 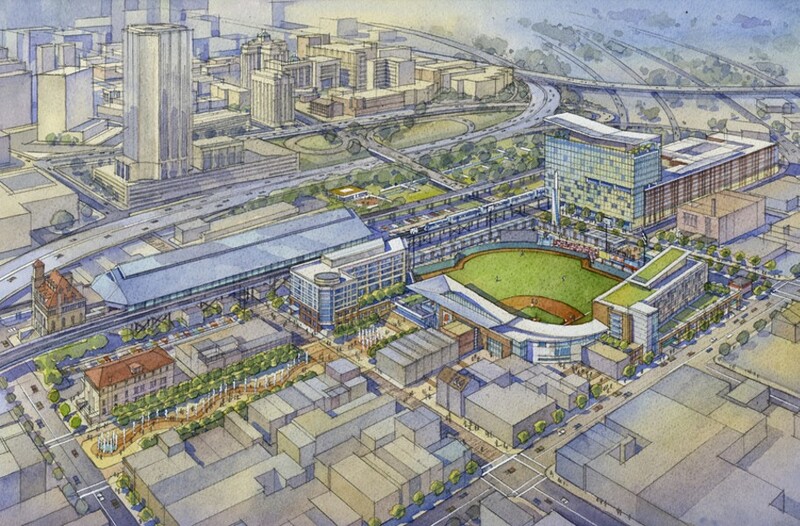 Opinion: Four reasons why a new ballpark in Shockoe Bottom is the right solution. The mayor's strategy to win over black leaders for a stadium on the hallowed ground of Shockoe Bottom.